On Friday, October 4, 2013, at a PLAN-Boulder County forum moderated by PBC board member Bruce Goldstein, Brett KenCairn, Boulder’s new senior environmental planner, gave a presentation titled, “’Legacy and Leadership’ Boulder Steps Up to the Challenge of Climate Change.” KenCairn’s presentation was offered as a preview of possible steps the city could pursue to further address climate change. The ideas were first aired at a July City Council study session and will soon be unveiled to the general public. KenCairn, who came to Boulder by way of the Applegate Partnership, led off with a list of the nationally recognized initiatives Boulder has successfully pursued, including Chautauqua, the Blue Line Amendment, the Open Space sales tax, the Pearl Street Mall, 300 miles of bike paths, extraordinarily high levels of photovoltaic (PV) installation, the carbon tax, and the climate action plan and its components. However, despite being a national leader in launching climate action measures, Boulder’s efforts so far are not getting the city where it wants to be in terms of greenhouse gas emissions (GHGs) reductions and, in fact, emissions are headed up, not down. KenCairn showed a number of PowerPoint slides illustrating the effects of global warming, including one from the National Academy of Sciences showing a 656% increase in wildfire probability for our area, but then asked, “Why belabor this issue?” He sought feedback from the audience on whether to reiterate the perils of climate change, “Do we show this to the community?” He asked whether focusing on the effects of climate change would be a counterproductive use of time in a presentation to the public, suggesting that the everyone may have crisis fatigue. According to KenCairn, the current crisis-focused messaging is not getting us very far very fast and we need to turn 180 degrees and instead focus on the opportunities that are out there. According to KenCairn and others, stabilizing temperatures means reducing GHG emissions to 80% below 1990 levels by 2050, a goal that has been tentatively endorsed by City Council. How can we reduce or eliminate that much carbon release? 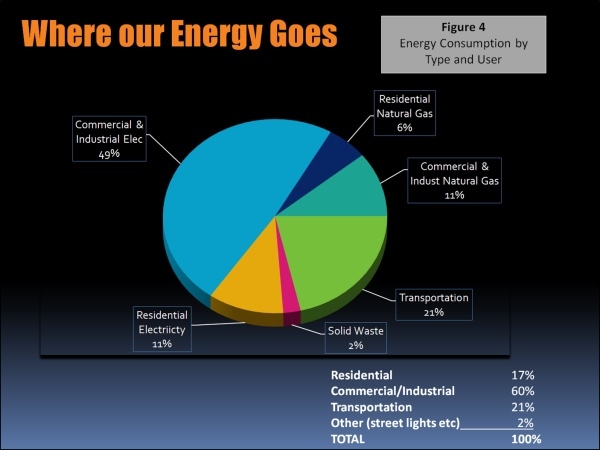 For Boulder, there have been challenges getting data from Xcel about energy use, but estimates show that residential uses account for 17% of energy consumption, commercial/industrial accounts for 60%, transportation 21%, and other 2%. Half of the residential and commercial/industrial components are related to the energy efficiency of buildings and half is going to support and generate economic activity. He suggested a carrot and stick approach that would address the emissions due to buildings’ energy efficiencies but that wouldn’t impinge on the process side of business productivity energy use. Elaborating on these insights, KenCairn pointed out that current conservation and efficiency programs could get Boulder 15% of the savings goal and that, combined with new conservation programs, Boulder could maybe achieve up to 30-45% savings. Regarding individual vs. collective action, he noted that changing personal behavior is not as likely to be successful when you have no control over the energy source; it is too easy to just flip on the light switch. However, the city has discovered through the municipalization analyses that, right now as a community, we could go out to the marketplace and get almost 60% of our energy from renewables. He brought up Portland as a perfect example of collective action. A Portland neighborhood, in which the individual neighbors did not feel competent or powerful enough to negotiate PV rates and costs, rallied to collectively obtain reductions by doing group purchases of solar gardens, solar services and installation costs. KenCairn lionized the German example, saying that it is “fundamentally disrupting the whole power system.” Germany is shifting to a system that is based largely on decentralized renewable energy and away from a centralized, fossil fuel-based system. Currently, in Germany, 65% of renewables are individual, cooperative or community owned. He urged the audience to read the Rocky Mountain Institute’s blog, authored by Hunter Lovins, that debunks many of the myths about the German renewables revolution. Boulder has a high level of PV installation relative to the rest of the country, but it could be much higher, and perhaps as high as 300-400 MW capacity (for reference, Boulder’s “annual energy needs (peak)” are about 250-270 MW now) but we can’t, under the existing utility configuration, install and exploit that much PV. He said that, with the recent flood, Boulder is coming to grips with the idea that we are going to have to focus on adaptation as well as mitigation. Micah Parkin, a candidate for City Council, asked if recycling, and the lack thereof, is fully accounted for in the city’s analysis. KenCairn answered that the GHG inventory tools that are out there now, and used internationally, primarily account only for energy use, and not consumption, so are inadequate in accounting for some components. 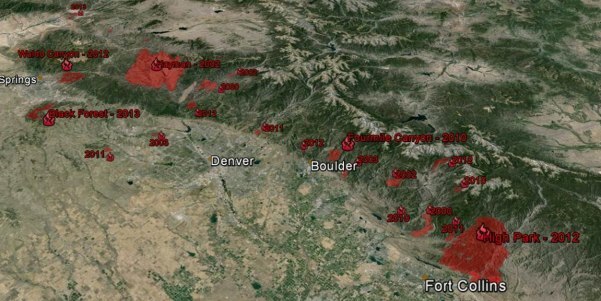 Boulder is contracting to build a new GHG inventory tool. City Council member Suzanne Jones asked, “How does the city integrate all the pieces, such as transportation, regardless of whether they can be accounted for in the modeling?” KenCairn answered that you can only get so far through conservation and efficiency, but we need to do more dramatic reductions, such as phase in electric vehicles (EV) as more renewables are phased in. But right now, your Nissan Leaf burns coal. He predicted that we will see a rapid transition to EV once the shift to renewables has made more headway. Former county commissioner Will Toor added that EVs are an important component, but that demand reduction is also important. Our per capita VMT (vehicle miles traveled) is not low and we need to see what can be done on the planning side and the land use side to bring VMT down. Also, about half of Boulderites with EVs have PV installed too, so their footprint is pretty low. KenCairn responded that we need to have a conversation over how much land use planning can reduce VMT, and over what period of time. Can we go into existing neighborhoods and dramatically change their land use? Parkin brought up the issue of local food and the potential energy savings there, to which Will Toor responded that rigor needs to be brought to the discussion of local food—it may or may not have a greater carbon content, and may in fact make matters worse if we’re not careful. KenCairn suggested that PLAN-Boulder County host a workshop about land use and climate. Right now, there are a lot of new ideas and initiatives but we are just talking in abstractions and don’t have data that actually show what land use changes would do; rigor needs to be brought to that discussion as well. He is hesitant to bet on land use planning if that approach won’t get us to our goals as fast as perhaps other approaches. Will Toor commented that PBC is seen as having a particular perspective and so might not be the best host of a workshop on the land use issue, citing their publication Does Dense Make Sense? Electric bikes are the “killer app” which reduce GHG emissions by about 98% compared to cars and 95% compared to electric cars! Why use a 3500 pound car to carry a 150 pound person when an electric bike weighs 50 pounds, and sips energy accordingly? Anyone who tries one won’t want to ride in any kind of box again, when practical. You arrive at work or meetings without sweating, but exhilarated and oxygenated. Groningen, Holland, with 59% of trips done by bike, is similar to Boulder: 190,000 people in 32 square miles. But it’s flat. Ebikes “level the playing field” for hills, distance, wind, age, injury, sedentariness and loads. Alfalfa’s has a Yuba Mundo cargo Ebike that will carry 400 pounds PLUS the rider! America, and especially Boulder, has been in a vehicle “arms race” for decades. It’s a monster truck rally, with 3/4 of the seats empty. Boulder’s local buses run 6/7 empty too, according to RTD’s “ride checks.” You just can’t pretend efficiency when you’re mostly carrying empty space around! Bike seats are 100% occupied. Boulder loves bikes for recreation, but it’s far too dangerous and polluted for most people to use bikes for daily transportation. Besides Ebikes, Boulder should adopt the “Idaho stop” which has worked great for decades. Cyclists treat stop signs as yields. It’s worked so well that now cyclists can treat stop lights as stop signs. Cyclists do these things at their own risk, and no extra accidents have been recorded. The Creek Path from 6th to 30th St. should be widened to accomodate the increase in biking and ebiking. I’d suggest an 8′ wide bike path and a 6′ wide pedestrian path. These widths allow 3 bikes or 3 peds to pass simultaneously. Let the peds have their path closer to the Creek. And straighten out the tight curves some!